Here you will learn what is Connect Anywhere feature, when it should and could be used, and how it can make your life easier. 1. What is Connect Anywhere? To get unlimited access to Connect Anywhere it is required to purchase additional subscription. You can choose to be billed monthly or annually. If you choose to be billed annually, you get 2 months for free! Subscribe now! It uses a network of relay servers, positioned all over the world, to establish a connection from any point on Earth. 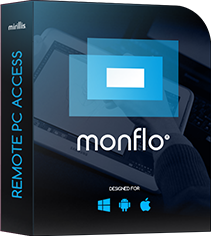 There is no restriction in using Monflo to get remote access over your Server computer from your Android device or another PC computer. Even double NAT will not be a problem! Important! Connect Anywhere is not intended to use for playing games. For remote gaming it is strongly recommended to use direct connections.